The plants and bushes are made in PS, some of the models were imported into Nendo 1.16 in 3ds file format and painted/textured there. (Nendo is a modeller but has painting facilities that works fine for simpler textures.) I made some Blueberry bushes, as well, beneath the big pine stub (a botanist would probably protest) and some sort of tall grass growing in the water. 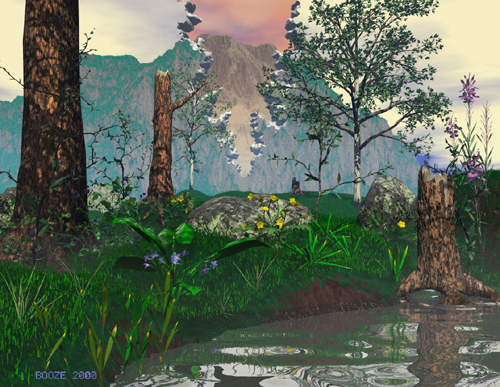 The birches are from Onyx tree (left) and 3DForest (right) and textured in Bryce 4. The pine stubs were modelled in Nendo and textured in Bryce 4 as well. All additional texturing and rendering was made in Bryce 4. The title, "A Cracking View", speaks for itself. A bit dystopian, but if we don´t care about nature, the only nature remaining will be the one we can recreate in PS, Bryce and other 3D applications ie the Matrix.